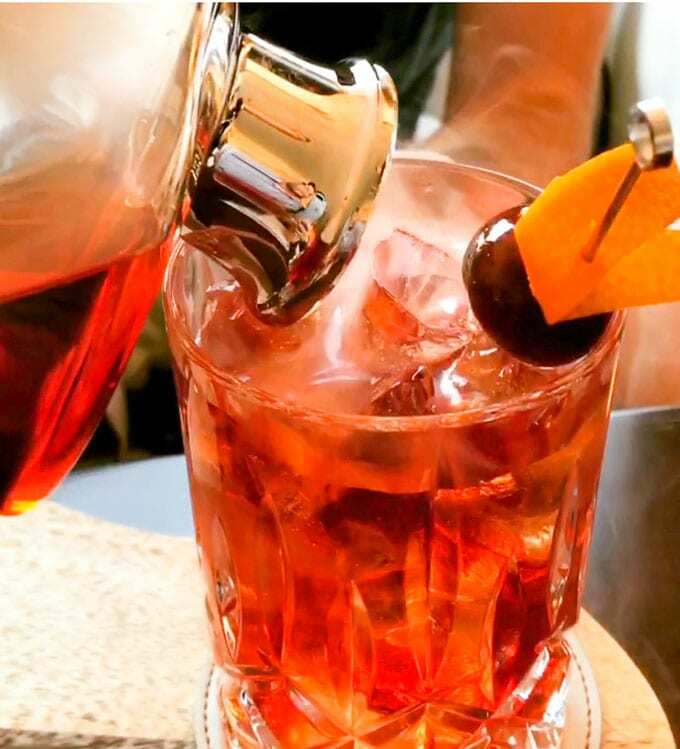 The Boulevardier is complex, refreshing and totally delicious, a fantastic drink for your cocktail repertoire. Hi, this is Lisa’s husband Eddie filling in as guest blogger to present my new favorite drink. Recently, Lisa and I took our three adult sons to Italy where we spent time in Florence, Venice and Tuscany. We explored the cities and the Tuscan countryside and snuck in a little culture and sightseeing here in there, but it was very much a food-themed vacation. I could go on and on about the fantastic cuisine we experienced, the vineyard or cheese farm we visited or the cooking classes we took, but one of the clear highlights, believe it or not, was a cocktail we had on the terrace of the Hotel Lungarno, overlooking the Arno river and the Ponte Vecchio. This hotel, which had just completed its renovation the day we arrived, had a cocktail menu with one whole section dedicated to negronis. 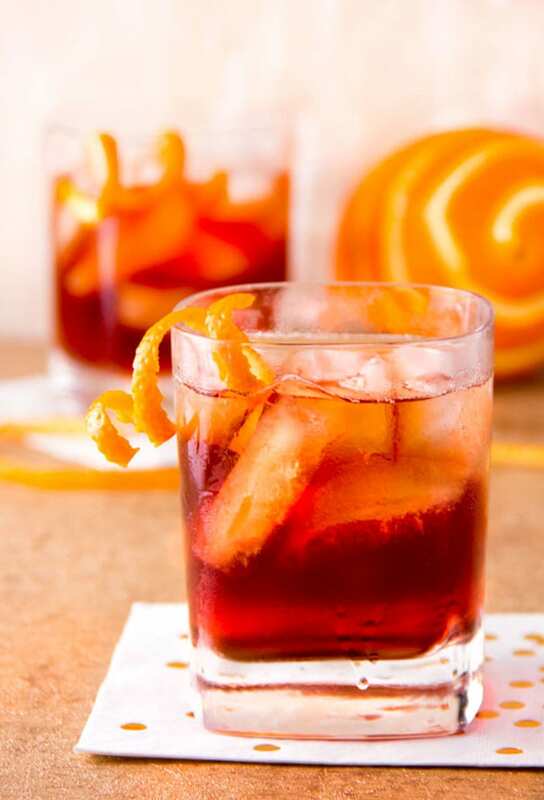 I had of course heard of a negroni, but I never realized that this drink originated in Florence and it never occurred to me that there was more than one cocktail called a negroni. Usually, it’s a pretty straightforward drink: one part gin, one part sweet vermouth, one part Campari, with an orange peel. But here were six or seven different cocktails under the heading Negroni. I scanned through them and at the bottom found one advertised as being smoky which caught my attention. Also, it was made with bourbon instead of gin – is that even legal? One of my sons and I went for it and were surprised when the server arrived and poured our drinks out of a glass flask filled with smoke. The drink was a perfect balance of sweet, tart and smoke. I had to know more. 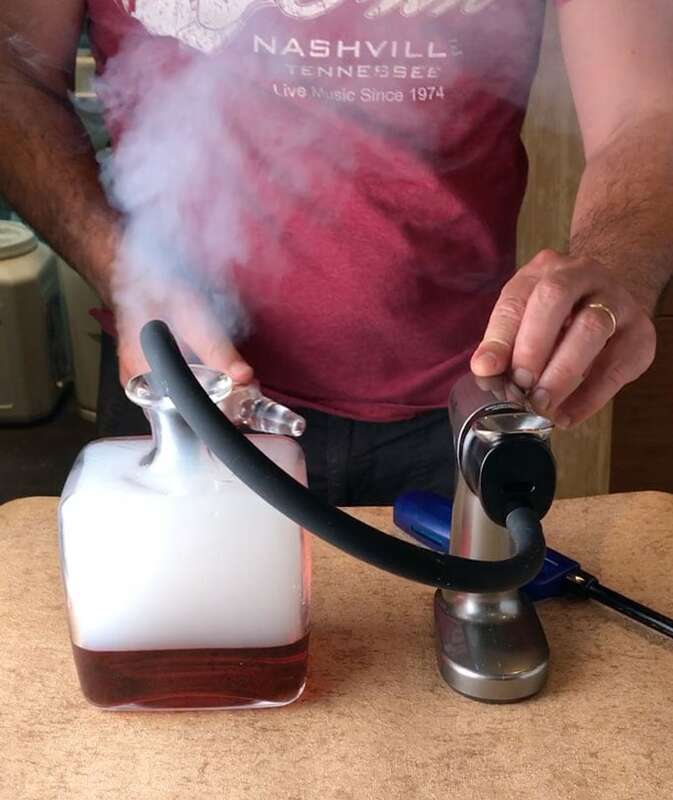 Turns out there is a device called a “smoking gun” that is used to inject smoke into a decanter containing the mixed drink. The smoke is sealed in there for 6-8 minutes, infusing the drink with smokiness before it’s poured into the glass. A few weeks after our trip, for Father’s Day, my sons presented me with a smoking gun and a glass decanter. And now after some trial and error – I feel like I have been in science class – I am pleased to present you with my ultimate recipe for the Boulevardier! A word about the drink’s origin. Despite its connection to an Italian cocktail, the name is a French word that means, unsurprisingly, one who frequents boulevards. 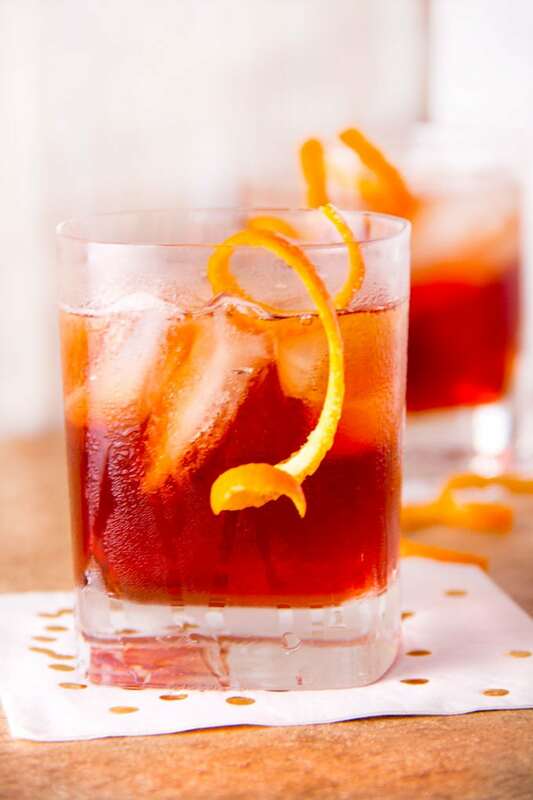 The creator of the drink is thought to be Erskine Gwynne, an American living in Paris during the 1920s who founded a monthly magazine called the Boulevardier. It’s a very fun drink name to say in any case, especially if you exaggerate the French accent, and it will add sophistication to your repertoire. While I loved the purity and egalitarianism of the negroni formula, I found that when using whiskey, equal parts produced a drink that was too sweet for my taste. As I did further research I learned that many have made the adjustment of increasing the whiskey content and reducing the other two ingredients. After several formulations I found that a 2:1:1 approach was well balanced, refreshing and also had the advantage of easy math. This Boulevardier recipe is delicious with or without smoke, so don’t be concerned if you don’t have a smoking gun. Just strain the chilled drink directly into a glass filled with ice. But if you’re interested in the smoke element, instructions are included, as well as links where you can purchase the smoking gun that I use. One more thing that made the discovery of this cocktail particularly memorable. While we were sitting on the hotel veranda, one of my kids handed me his cell phone – into it he had typed: “that’s Aaron Paul at the next table over, don’t draw attention”. Our whole family had binge watched Breaking Bad and there was no doubt this was the actor who played Jesse Pinkman. We did our best to act natural and give him his privacy. But when the Boulevardiers arrived at our table, and were poured out of the smoke filled decanter into our glasses, I saw Aaron staring in disbelief at our drinks. “What are those! ?” He asked. He ordered one for himself and then did some quick research and found the smoking gun and decanter on Amazon. 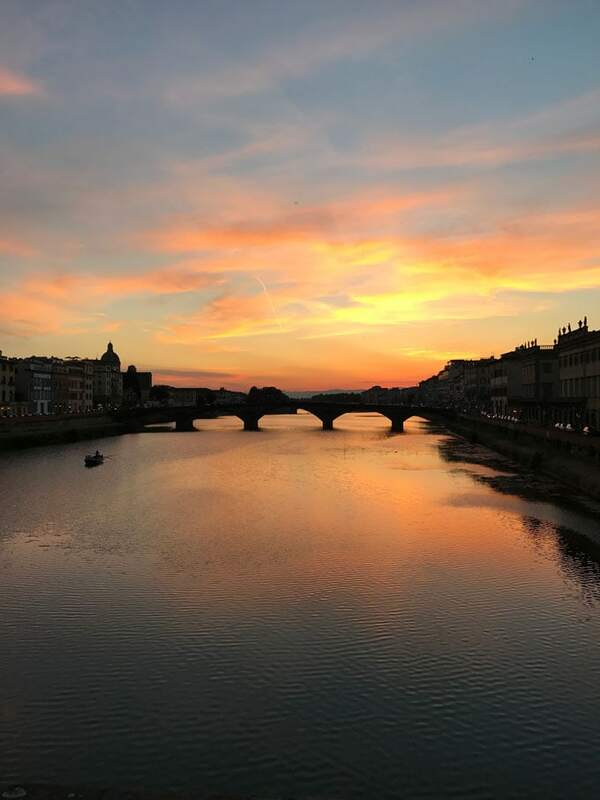 We ended up in conversation with him and his lovely wife, drinking our newfound favorite drinks, looking out over the Arno and feeling grand. Here’s the Boulevardier recipe, with and without smoke. If you make this I hope you’ll come back to leave a comment, a rating, and let Lisa and me know how you like it. 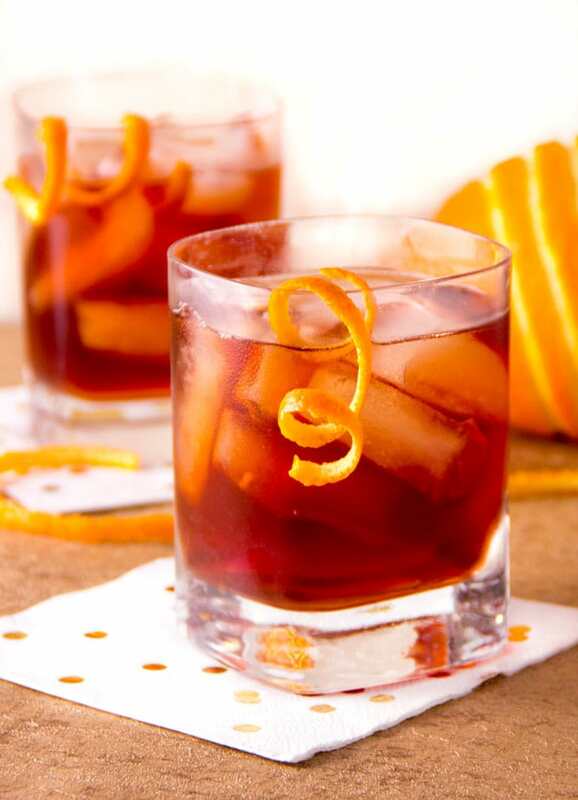 The Boulevardier Cocktail is complex, refreshing and totally delicious – a great drink to add to your cocktail repertoire. Mix the bourbon, vermouth and Campari together in a cocktail shaker with ice and stir until very cold. Strain into tumbler glasses filled with ice. Add orange peel garnish and serve immediately. Pour bourbon, vermouth and Campari into a a cocktail shaker with ice and stir until very cold. Then pour into a container with a tightly-fitting cork, ideally a glass decanter. Insert the hose of the smoking gun into the mouth of the decanter. Light the gun to fill the decanter with wood smoke. Remove the hose, cork the decanter tightly, and leave it sealed for 6-8 minutes. Then pour (drink & smoke) into ice-filled cocktail classes. Add orange peel garnish and serve immediately. Experienced the Smoked Boulevardier at Fahrenheit 132 in Fredericksburg VA this past week…exceptional!!! Have already purchased a “smoking gun”….they used a small glass bell that just covered the glass, but I like the decanter method. Will be trying soon. Making ice ball from blood orange juice + water. Sounds tasty! I am going to make it. 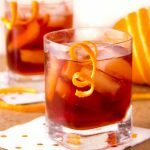 Hi Lisa – I have been using Bulleit bourbon and Cocchi Vermouth di Torino for this drink. I’m sure if you have your own favorite bourbon that would work fine too but I definitely recommend going upper end on the vermouth – either Cocchi or Antica Formula. It’s totally worth it. This recipe truly made my weekend! Any bourbon cocktail fan should give it a go. Excellent even without the smoking bong. Can’t wait to try this. Eddie is a cocktail genius!